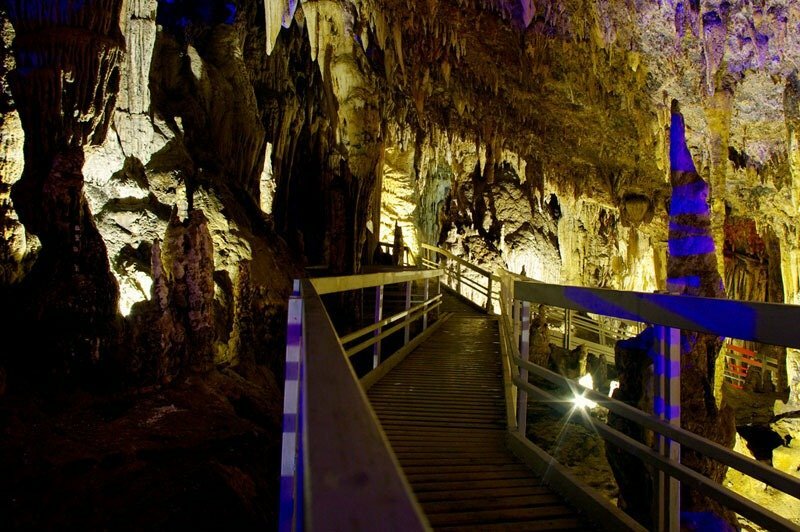 Ha Giang’s first and most recently opened cave on the plateau is Lung Khuy cave. An amazing natural spectacle tucked away in the hillside between Quan Ba and Yen Minh. You have two choices of how to get to Ha Giang town. You can take a bike from RentABike Hanoi and drive up. This involves a very long drive (300km) or you could consider a stopover in Vu Linh or Green Vietnam. If you make the trip in two days you may wish to stop just 25km short of Ha Giang at Noong Lake, which makes for a nice picnic location if you have time before heading to the main town. RentABike Ha Giang is conveniently located in Ha Giang town close to the bus station. This means you can easily take the night bus and then pick up one of our bikes in the morning. After resting with us and having a nice shower, all for free of course. The cave was opened on 31st Dec 2015 after 5 billion dong was invested to make it accessible to the public. There is a path, about 1km long, from the road up the hill to the entrance and a network of some 400m of metal walkways acting as viewing platforms. The hike up to the entrance of the cave. Halfway along the path is a view point where you can take a nice selfie. At the end of the path and close to the entrance of the cave is a small café, toilet and ticket booth. It costs 50,000vnd for an adult, 20,000vnd for children and free for anyone under 6 or over 60 years old. On the route to the cave, you will see ethnic women selling seasonal local produce such as rock honey, turmeric, radishes etc.. and then once inside you will see some very impressive rock formations. The local authorities developed the cave into a fantastic tourist attraction and the metal walkways throughout make it accessible to everyone. This map should help you to plan out your route and choose which places to visit. Taking this route will allow you to stop at Heaven’s Gate to take a few photos and then on to the lookout point to see Fairy Mountain. For the more adventurous driver there is an alternative route to Quan Ba and Lung Khuy Cave. Initially, you follow the 4C to get out of town and head northwards. After around 8km you will come to the small town of Pac Cap. There is a bridge across the river, which you cross and then turn left to continue northward. This is good road for about 10km and then it turns into a wide dirt track that gets gradually smaller and smaller. There are one or two small river crossings but nothing worth worrying about. You will be in the middle of nowhere with little chance of help so it is wise to take things slow. Taking this route on a semi-automatic is fine in the dry weather but after rain it would be a lot more challenging. Once you have come down into Nam Luong the road follows the river to Lung Tam and then climbs a little to your final destination. This is a great drive but you should make sure everyone in your group has experience driving and that the weather is not been too bad for the few days before you take it. Delicious dinner at Nam Dam Homestay. There are many places to stay in Quan Ba town and most of them are small guesthouses that have basic rooms and some which can offer food. A better option is to stay in one of the Dao Guesthouses in Nam Dam. These are family-run homestays and have everything you need: hot water, fire, toilets and bathing facilities (shared), fans, warm beds, great food, beer and ruou (rice wine). Another contact is here. You should call ahead or book in advance to make sure that there is enough room for you and food. 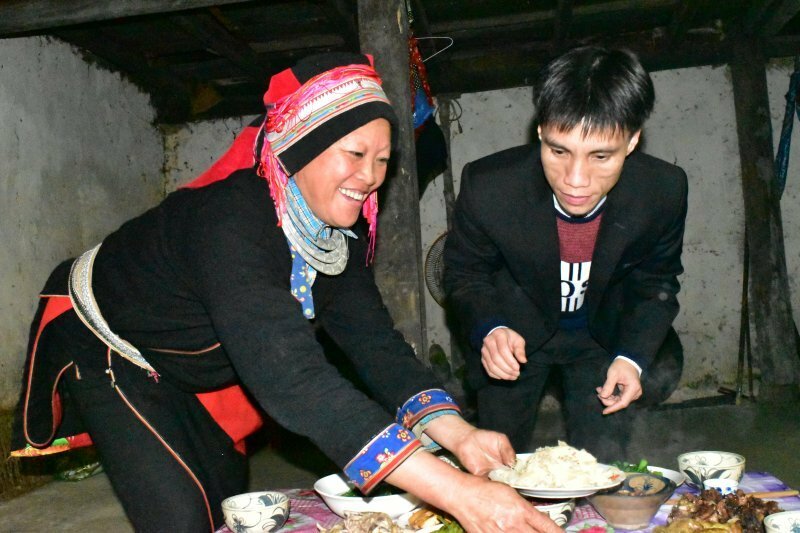 Most people will tell you that the season in Ha Giang is September to November but, in reality, it does not really matter when you visit. It is true that the skies are clearest at this time of year and there is the Buckwheat Flower season which makes many fields look gorgeous. However, it is possible to visit at other times of the year. Take a look at average temperatures here. You should look carefully at the weather between January and March this is when it could be coldest and also in July and August as this is when it could be wettest. This year, 2016, has been particularly warm and dry so visiting in December was no problem at all, although, the haze makes it difficult to get good photos. All in all, make your decision when on the ground after consulting several different weather services and feel free to contact RentABikeVN to find out about our rental bikes and answers to any of your questions regarding bike trips in the area.